I’ve collected a lot of garden tools over the years. Some I have purchased. Some my dad left to me when he passed away. Some have even been given to me as gifts. I do find myself using the same tools over and over again. There are a lot of choices available, and if you are a beginning gardener, the choices can seem overwhelming. Exactly how many types of pruners do I need? I am going to give you 4 tips on how to choose the best and most useful tools, save you some money, plus give you a free bonus, so you know exactly what to get to make gardening easy and fun. 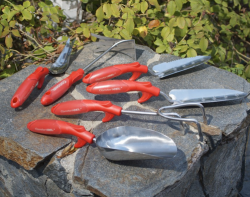 The Right Tool for the Job: Standing in front of the garden tools display at a nursery or big box store can be confusing and overwhelming. 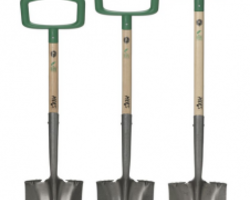 There are numerous varieties of shovels, rakes, and hoes. 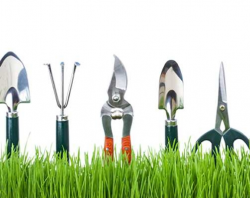 Before you buy any tools, take stock of what tools you might already have and decide what gardening you will be doing. For example, are you clearing and replanting flowerbeds? Tilling and planting a vegetable garden? Planting containers on a patio? These jobs may need different types of tools. Do a little research, and make a list (hint: see #5 to help you out). Cost: Garden tools can be expensive (or not). You can spend $59.00 on a beautiful hand forged copper and beech trowel, but you can also find a simple but high quality shovel at a garage sale for $5.00. Your budget and the size of your space will determine how many tools you will need. Ebay, garage sales, and even thrift stores can be great sources for inexpensive tools. Ease of Use: I am 5’2″, so sometimes it is difficult to find tools that are properly sized for my height. I have an amazing pointed head shovel by Hers (available from Sow Swell) that is available is three sizes. Really feel the tools in your hands and carry them around for a few minutes before you buy (just like trying on a new pair of shoes in a store) to make sure they feel good in your hands and are not too heavy to wield. I also love Corona hand tools as they are high quality and extremely comfortable to use. Corona Tools have extremely comfortable handles. 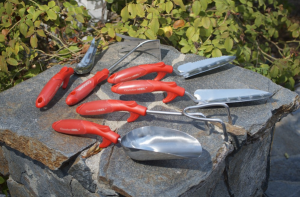 Quality: Gardening tools should last! Look for high quality metal that has been forged / finished well. Metal parts and handles should be firmly connected. Wood handles should be made of hardwoods like ash or beech, sanded, and varnished so there are no splinters. Handles of man-made materials should not have any rough edges. Cutting tools should be sharp. Here’s My FREE Bonus for you! 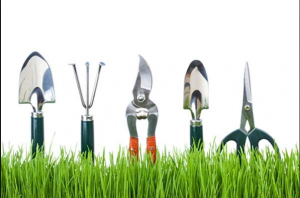 Do you want to know which tools you should have for your garden? You don’t need to make a list because I’ve made one for you! 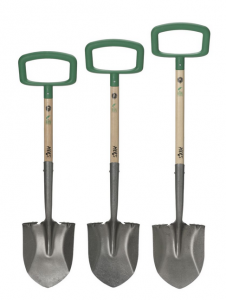 Grab your free Garden Tool Checklist here.